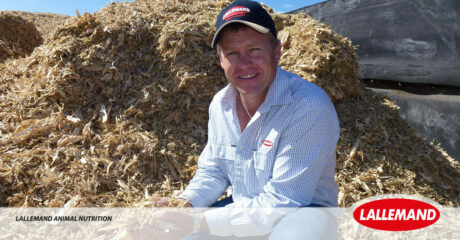 THE Australian livestock and forage industries have been rocked by the recent death of one of the country’s leading silage production and nutrition consultants, Trevor Schoorl. Trevor was tragically killed over the Christmas period whilst loading a ride-on lawn mower onto a trailer. Lallemand Animal Nutrition Country Manager, Alex Turney, says Trevor was a highly-respected figure in the dairy, feedlot and forage contracting sectors throughout Australia. “Trevor’s knowledge of silage production, milk and beef production systems and ruminant nutrition was second-to-none,” Alex says. “His honesty, accountability, humility and hard-working nature earned him the respect of his many clients and colleagues throughout the world. “Trevor was regularly invited to speak at industry conferences in Australia. “He attained the respect of some of the largest beef and dairy operators, including Moxey Farms, JBS, Mort & Co and Teys Australia. “Likewise, he was regularly called upon by corporate farming operations, such as AustAsia Dairy Group in China or Elders’ feedlot operations in Indonesia. “He had a particular knack for developing solid working relationships and he treated everyone with the same kindness and respect, regardless of their position. “Trevor’s clients and colleagues will be forever grateful for the significant contribution he made to their businesses. “We are completely devastated by the tragic loss of an incredibly beautiful family man, friend and colleague. Graduating from Gatton Agricultural College in 1993, Trevor spent more than decade working in the genetics industry in Australia and managing large dairy operations in the USA and Dominican Republic. In 2004, he returned to Australia to become Technical Services Manager with Quality Silage Systems, which was acquired by Lallemand Animal Nutrition in 2010 following the retirement of its founders, Ken and Trudy Rich. Besides servicing livestock and silage producers throughout Queensland and NSW, Trevor frequently visited China, Indonesia and Papua New Guinea regularly to provide technical support and training program for Lallemand staff, distributors and key customers.